Most moms know that breastfeeding is best for baby and for the moms that decide to breastfeed (it is a choice) there are a lot of great support groups online. Breastfeeding.com provides an online community that helps support moms and Baby Center has many articles for new mothers to help them learn the benefits of breastfeeding and the how-to’s to help moms problem solve. The support and encouragement to breastfeed is certainly more common then it used to be but what about the mothers who do not breastfeed their babies? 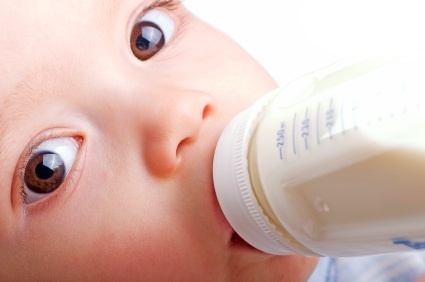 Is there support and guidance for those mothers on the formula to choose, safe BPA free bottles to use, how to prepare the formula and how much to feed the baby? I am sad to report my findings are showing there’s very little out there. Read more about the bottle vs. breast study at Green and Clean Mom! i honestly think i would’ve lost it at like 6 months because of sleep deprivation. and i credit breastfeeding for saving me and my son. i think the point is not that bottlefeeding = abuse. but rather that there is *something* that you get from breastfeeding that you don’t with bottlefeeding. and that is oxytocin, which *CAN* calm a mother, and *CAN* strengthen a bond that it tenuous in stressful times. Jennifer, thank you so much for writing this article, I honestly had tears welling up in my eyes reading your story. I too did not have a real “choice” as to whether to breastfeed or bottle-feed. I suffer from PCOS and adrenal problems, I feel fortunate that I had my two daughters. I tried for 3 months (both times) to breastfeed, I saw lactation consultants, pumped 10-12 times a day, took nutritional supplements, and tried to remain as calm as possible (not easy when your body produces cortisol at extremely high levels). Unlike you, who obviously has a better handle on self preservation, I attempted all this twice. Neither time was I successful. I never developed breast tissue during either pregnancy and my hormones are completely out of wack. I have repeatedly felt alienated, mostly other women, who acted disgusted when I inform them that I did not breastfeed, after they declare that my children must be breastfed because of how healthy they look. I almost had a nervous breakdown trying to come to terms with the fact that my body could not do it. I think it is about time that people respect the choices that a mother makes and stop making snap judgments. Having talked to other mothers who did not breastfeed, I have found more that had similar problems (hormonal deficiencies) as I. Unfortunately, both my sister and I have messed up endocrine systems thanks to genetics. Unlike my sister, who has more severe PCOS and may not even be able to have children, I have been lucky enough to have two healthy children. I think that is more important in the end. Too much stress can result in emotional problems, cause strain on you marriage and hurt your relationship with your newborn. Just to clarify, I did not write this article. Sommer of Green and Clean Mom did. I was lucky to be able to breastfeed both of my children until they were 2.5 years old. I thought it was important to post this as a guest post as I feel it is important not to be judgmental. Woops, sorry Jennifer, didn’t notice the credit at the beginning to Sommer. I am so happy to have read this article. I absolutely agree 100%. I suffered through a similar and very traumatic breast feeding experience as well. I cried constantly at my failure. But once I switched to formula and ‘forgave’ myself, I was so happy! Now, I tell all of my pregnant friends to expect that this might be a possibility, and have counseled several who have also experienced this! Thank you so much for standing up for those of us that want what is best for our child, but find out that pain, stress, and starving babies aren’t it! I personally would never tell you that you did anything wrong by not breastfeeding. It is the system that isn’t made to support women and give them the correct solutions when there are problems with breastfeeding (someone told you to eat more? Seriously? I’m highly doubting you were eating so little that it would diminish your supply. It has to be pretty drastic for that to happen). Breastfeeding experiences would not be so awful if women had the correct support. There was one thing you wrote that I really didn’t like though. Breastfeeding is not a choice. Yes, there is choice involved, but the choice is to NOT breastfeed. Breastfeeding is the biological norm. When you stop breastfeeding, your body keeps trying to produce milk and you have to do things like binding your breasts or take medication to make the pain go away. You are choosing to not do what your body tells you to do. So you choose to formula feed, you do not choose to breastfeed.